Discovering new ways to photograph still life is very important to me. I love to explore these new ideas in my studio environment. Playing with light sources, different objects, and angles, and just being creative often leads to new ideas and results. The true creativity behind the still life photograph comes out because of the freedom of not being criticized or prevented by the client. For this image, I decided to focus on paper and the art of sculpting. I wanted to create something different and intriguing, that incorporated both elements of paper and light. With a little cutting, folding and bending you can turn a simple piece of paper into interesting shapes and artworks. Paper sculpting and the practice of folding paper began in Japan. Origami is the popular Japanese term for folding or sculpting paper. Paper sculpting has fascinated me for some time. So I decided to use the skills I have developed to create the subject for this image. First, I cut and folded two sheets of paper. These pieces of paper were then assembled together. The brown base color swirls around and ends up with a narrow top, whilst the yellow paper carefully encloses the brown paper as if acting as a coat around shoulders. Taking the shot was straight-forward. It didn’t require much post-production editing either. To capture the image I used a white horizontal background and had the paper sculpture suspended from a fishing rod. As it spun around on the line I managed to take multiple images from different angles until I found one I liked. 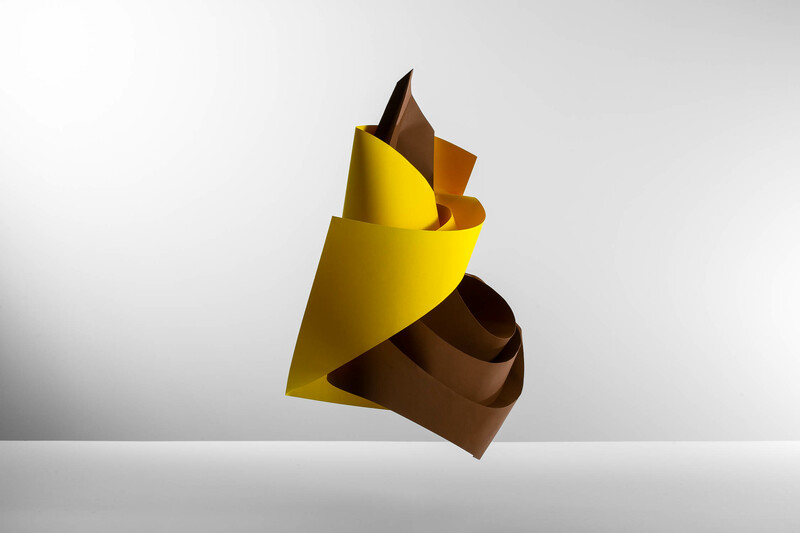 In a commercial shot, one could print or add the brand or message to the paper sculpture or have the piece represent something. I created this image purely for experimental purposes. I wanted to showcase the creativity and freedom one can go to when creating still life photography. Finally, after having created this still life photograph using art sculpting I am familiar with the process. I have the experience and process on how to create a paper sculpture in still life photography If a client asks for something similar. Would you like to see more images like this? Please leave your thoughts below and thanks for reading.